The first time I ever crowd surfed was at a Pearl Jam concert. The first time I ever did a stage dive was also at the same concert. So when I went to a Pearl Jam concert last weekend you better believe that these memories surfaced. I remember the feeling of being lifted up by hundreds of people as I slowly made my way from the back of the crowd to the stage and then back again. It was exhilarating and scary. That was in 1993 and I was still in high school. My life was different then and so were my goals. But the one thing that stuck with me in that moment was the rush of adrenaline I received by being surrounded by so many people who were laying their hands on me, lifting me up, and helping me reach a destination. A couple of weeks ago, when I saw Pearl Jam again, the concert was much more tame. It didn’t have the same energy that the first concert did in 1993. Some of that has to do with the dynamic of age. The crowd this time talked about back pain, waking up early to take care of kids, and healthcare. The crowd when I was younger could care less about any of that. However, I think there was more to this tameness then just age. I think it was more about movement and where we are as a society. All of these words have one thing in common. They all require you to stop moving for a moment to record what it is you’re doing. Now I must admit that even I participated in the madness by posting to Facebook my love for the band. Even though I disagree with most of their politics and some of their songs, they still have a place in my life. But I was surprised when I got home and discovered how few pictures and videos I got from the concert compared to the many others that went. The next day I saw people post several videos, pictures and thoughts to Instagram, Facebook and Twitter. 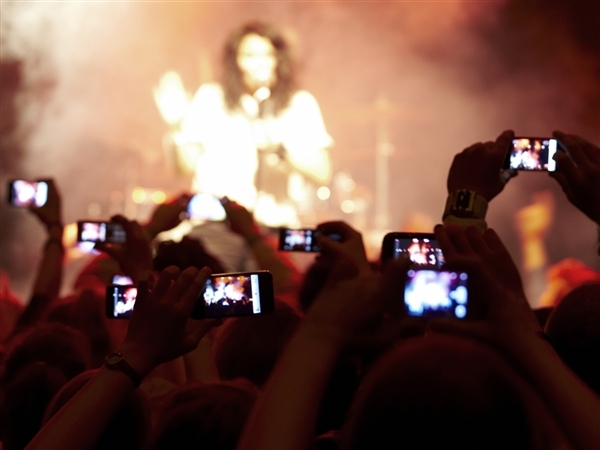 In fact, at one point when I looked out over the crowd during the concert I saw just as many phones as I did heads. So why do I share all of this? Because I think this is a symptom of something bigger. Social media is teaching us to stay within ourselves. Although we are sharing our experiences with the world we really aren’t experiencing the very thing we are posting to our Twitter or Instagram. This doesn’t mean that we have to crowd surf but I do think that we need to do more within a real community and less within a virtual one. This requires conversation, laying hands on one another, and lifting up one another. Like it does when you crowd surf. It takes faith, it takes community, it takes risk, but most of all it requires the participation of everyone around you. Now I am not advocating that you crowd surf to experience the same thing I did when I was younger. In fact, don’t…you might get hurt. However, I am suggesting we do less standing around with our phones and do more life together. The thrill of being lifted up, the laying on of hands, and being pushed in a particular direction should be a part of the Christian community. 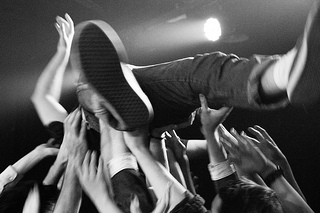 It is exhilarating and scary…just like it is when you crowd surf for the first time.